You are going to measure which place has the most bacteria. Ha1: The section where nothing was added had the most bacteria. 3. Swab (rub the area with the cotton swabs) the areas you wanted to test. 4. 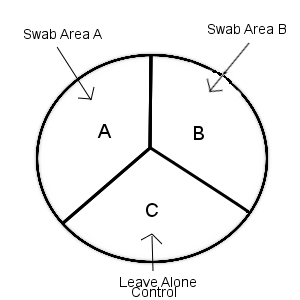 Get a Petri Dish that is labeled with three areas A,B, and C and has a growth medium in it (bacteria food). 5. Rub over the correct labeled part with your cotton swab. 6. Put the cover on it, tape it shut, label your names and class period with masking tape. 7. Put Petri dish in your period’s area of the room. 1. Which area A, B, or C had the most bacteria growth? Which had the least? 2. Which hypothesis from #4 was the correct Hypothesis? Rewrite the hypothesis here. This should answer the question you wrote in #3. 3. Where you surprised by the result? Why or Why not? 4. What other places would you like to test? Why?